EA has agreed to give up NCAA exclusivity for five years and pay out a potential $27 million to wronged customers. 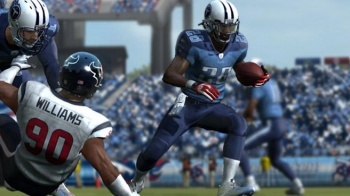 EA's unrivaled dominance of the American Football sim market may be coming to an end. According to attorneys representing consumers in a class-action antitrust lawsuit that began back in 2008, the publisher has agreed to go five years without exclusive control of the NCAA and AFL licenses, and a $27 million payout for consumers. The class-action suit alleged that EA successfully created a football game monopoly. Back in 2004, Take-Two Interactive had grown tired of playing second fiddle to EA and its Madden series The publisher's last football title, ESPN NFL Football had sold a less-than-impressive 450,000 copies. Take-Two's next title, NFL 2K5, was released at a $20 price point and went on to sell more than 2.9 million copies in the US. To remain competitive, EA lowered the price of Madden 2005 from $50 to $30. Shortly after, EA signed exclusive deals with the NFL, NCAA and AFL, meaning Take-Two had no official backing for its football titles, and thus, no series. EA then released Madden 2006 at a $50 price point. Under the terms of the settlement, EA will let its current agreement with the NCAA lapse in 2014. It also can't sign or renew exclusive deals with either the NCA or the AFL for at least five years. The publisher may also have to hand over some cash to gamers who bought its hand-egg titles. Consumers who bought an EA football title for the GameCube, PS2 or Xbox could be entitled up to $6.79 a game, while those who bought a current-generation football game from the publisher could claim up to $1.95 a game. The proposed settlement was filed with the court last week, and EA has apparently agreed, but it still must be approved before it can be made final.